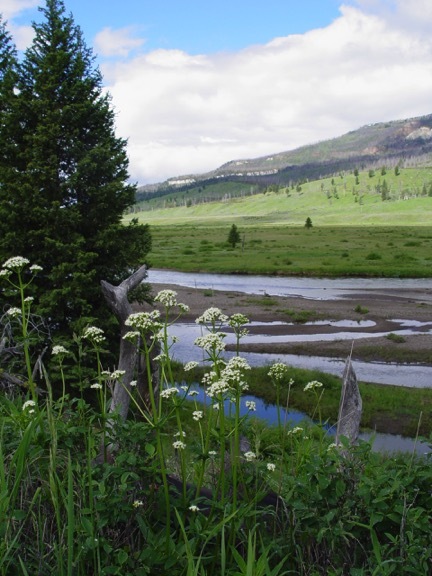 We may not normally think of our national parks as community gardens, but consider that Yellowstone Park itself, an ecosystem protected for the enjoyment of the public, averages 3-4 million visitors a year. And as a counterpoint consider the day-to-day experience of this world by a unique resident—Sherry M.—who grew up in the foothills of the Absaroka/Beartooth Mountains—part of the Greater Yellowstone Ecosystem. Together with her family she has moved their cattle to and from a National Forest grazing allotment in the Absaroka region. 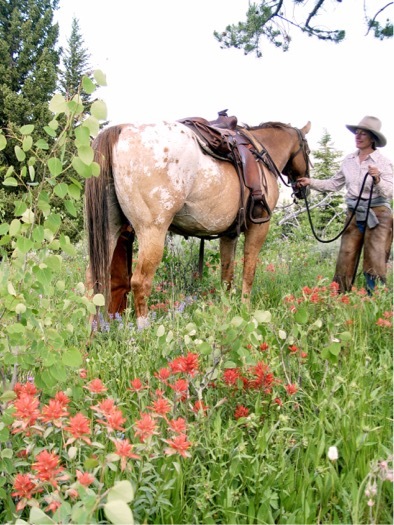 For the past 18 years Sherry has been one of the few female wranglers at a guest ranch on Slough Creek. Vehicles are not allowed so all of the Ranch supplies come in 12 miles by horse drawn wagons. "I have been riding these trails for years. There used to be many more people around. During hunting season years ago when we camped at Frenchy’s Meadow. You would see a dozen lights from other campfires. 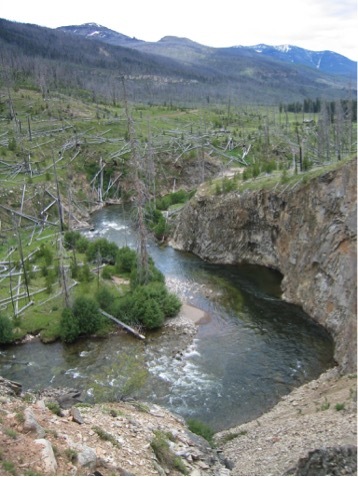 But ever since the devastating 1988 fires, many of the trails were blocked by deadfall and some are still closed. You could ride all the way up Tucker Creek to the high meadows and it would be all timber. All the burned areas were lifeless, no sounds from small animals or birds, no scents of pine or flowers. It was like a dead zone. It’s amazing how the land heals itself. Although still scared, its return to beauty is wondrous to behold. 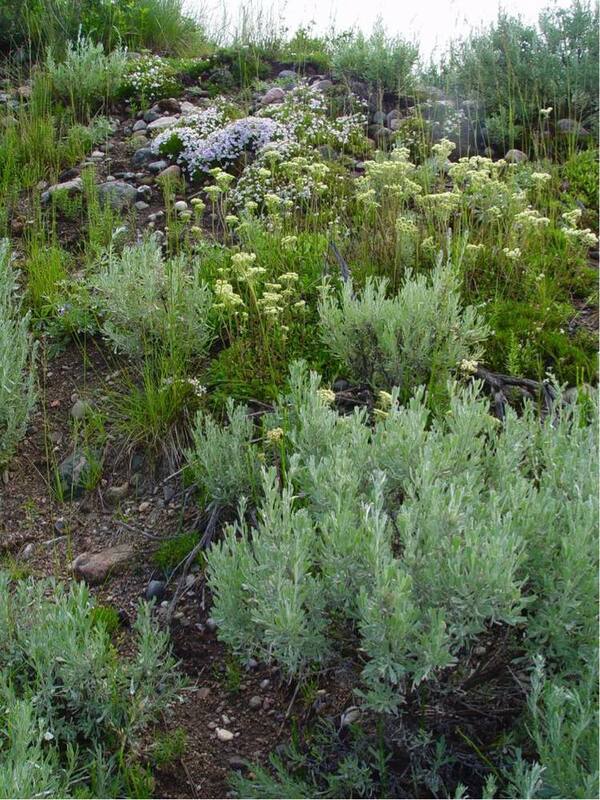 At the ranch, I tried growing a garden. The season is short—we are here from May to October. The ground squirrels ate most of my produce, so I eventually gave up. At 6,800 feet, the elevation is also a factor! But I am so blessed. Everywhere you look there are flowers and I love them. In May we get the early flowers—blue bells, glacier lilies, shooting stars and phlox. And then it just progresses, when one is done blooming another kind starts. After years of being in the mountains you just get to know where to look. One of my favorites, the magenta paintbrush, grows only at higher elevations. There is the fairy slipper orchid which you very rarely see. Marianne told me she saw one in a small spruce grove near the ranch. They are very small and usually grow in the shady forest. I found a white bog orchid near a stream in a meadow not far from the ranch. That was exciting! Thanks to Sherry, who pointed out the white bog orchid to Whitney Tilt, it was included in his guide, Flora of the Yellowstone. I have a new camera and only today [July 8, 2017] took a picture of some small pink flowers 2-3 inches high. I am still seeing flowers I have not seen before. I take pictures of them, then see if Whitney’s book can identify them. I am blessed to wake up each morning and go out to enjoy God’s beautiful creation. -Story contributed by Marianne S.